Lots of docking skills are taught in this class; plus anchoring, reefing, grounding, and dead reckoning navigation. It is taught on a 30′ boat with wheel steering and inboard diesel. On the third day we take a trip navigating to a cove for lunch. 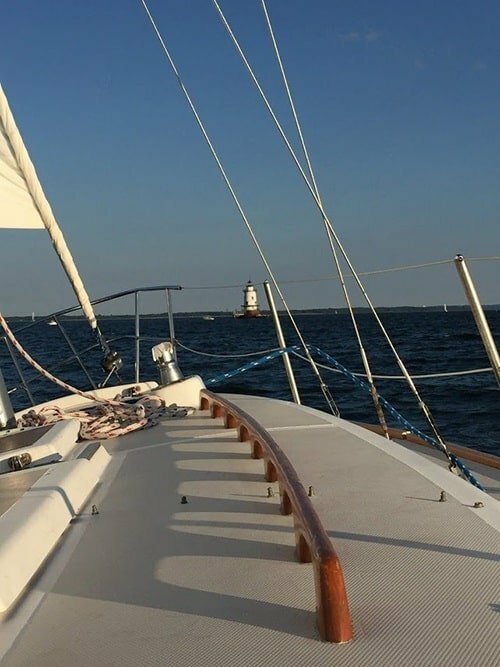 At the end of this course, students will be able to leave the slip, navigate out a harbor, raise sail, anchor for lunch, and bring the boat home into the slip! Greeting and course overview, docking forces, and how a boat responds under power. The morning is spent learning all about docking. Engine operation, vessel under power at the dock, securing the boat to the dock, leaving and returning to dock upwind, understanding and using prop wash and prop walk, spinning in place to starboard, docking to port. The afternoon is then spent sailing, tacking, and jibing. 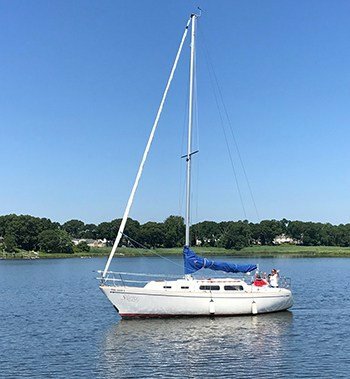 Continuation of docking skills, transitioning from motoring to sailing, anchoring, man overboard, and reefing. Navigation, float plan discussion, grounding and tides, VHF and emergencies, taking a tow and salvage, and knot review. This is where the pieces are tied together with a short trip. With instructor observing, students take the boat out of slip, motor out to the bay, navigate to the anchorage, and anchor the boat. Then, we sail back to the classroom for a test.